I received the handy guide, Your Personal Guide to Breastfeeding , for review and I can’t recommend it enough! Your Personal Guide to Breastfeeding isn’t a book, instead it’s a easy-to-carry, fold-out chart (wow! that was a lot of hyphens) for moms who need concise breastfeeding information at their fingertips. If you need to know how to get your baby to latch on or the proper foods you need to eat for maximum nutrition, this guide is absolutely perfect. Everything you need to know is right here and it’s so thin it can travel anywhere with you. 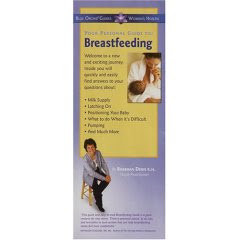 Plus, it’s only $8.95 from Amazon.com — a small price to pay for a ton of useful breastfeeding information.